Most cemeteries regulate the headstones placed on graves within their grounds. Cemetery Rules and Regulations, as they are known, stipulate such attributes as material, size, and type of headstone. Before you order a cemetery headstone for your loved one, it is very important to become familiar with the requirements set forth by the cemetery. They can and will refuse any headstone that does not meet their requirements. Here are questions you may want to ask when inquiring with the cemetery about their restrictions of cemetery headstones. 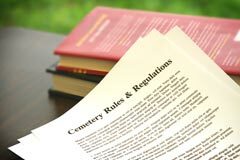 If at all possible get a copy of the cemetery rules and regulations for your own records. What type of cemetery headstones are allowed? Example: Upright headstone, flat bronze grave marker, flat granite grave marker, side by side companion, double interment grave marker, individual, infant, or veteran's marker, etc. What are the minimum and maximum sizes allowed for cemetery headstones? A cemetery usually has a range of sizes they allow for the headstone. Make sure the size you purchase is within their range. Is a flower vase allowed? Some types of cemetery headstones are available with a flower vase in bronze or granite. Make sure your cemetery allows a vase before selecting this option. Are there any granite color restrictions? While most cemeteries do not regulate granite color, a number of them will stipulate the color of granite allowed, especially for bronze markers with a granite base. If they allow bronze markers, do they restrict the bronze coloring? Some cemeteries refer to the bronze coloring as oxidation. Most cemeteries allow any bronze coloring, but a few will restrict the color to dark or light brown. Make sure you know what colors are allowed before selecting this option. What other particular specifications do they require? A few cemeteries will have specific requirements such as lawn mower proof edges (for the granite), specific size requirements for the granite base, or that a Christian symbol be incorporated into the memorial design (Catholic cemeteries). It is wise to be aware of any particular requirements before finalizing a headstone order. Is any paperwork required for the placement of a cemetery headstone? Cemeteries often have special forms such as a permit or authorization that need to be filled out for the placement of a cemetery headstone. These forms often require the signature of the lot owner(s) or next of kin before they accept a headstone for installation. Is there an installation fee applicable to cemetery headstone? If the cemetery will install the headstone then there is most likely an installation fee. This is normal as they are performing a service. Once you have the answers to the questions above you can start pricing headstones from monument dealers in you area or even online. "While dealing with my mother's passing I have already fallen prey to "It's the Law. ", statements that turned out to be false. While I do not want to be distrustful of everyone, I found your warning about some phrases used by cemeteries to discourage shopping around to be a good lesson. I will be very careful as I make my choice of monument providers." Many cemeteries require some sort of documents to be filled out for placement of a cemetery headstone on the grave. These documents normally call for information regarding the specifications headstone and sometimes require a drawing. They may also request information about the monument dealer who is selling the headstone to you. Finally the lot owner or next of kin may need to sign the form authorizing the placement of the cemetery headstone. In many cases the company in which you are purchasing the headstone from will assist you with this paperwork. They should be able to complete the forms and provide most of the required information pertaining to the cemetery headstone. One important thing to understand is your rights as a consumer. Specifically where you want to purchase the cemetery headstone from. While most cemeteries operate in an honest manner, some will resort to unethical tactics to try and discourage a customer from purchasing cemetery headstones from an outside dealer. A cemetery may flat out say they do not accept cemetery headstones from outside sources, or they may say that an installation fee will be levied if you purchase from another dealer, but not from them. According to the FTC this is considered illegal by federal law as it is restrictive of free trade. Although the majority of cemeteries operate in a fair and ethical manner, there are some that may not. Here are some of the things that may be said by the cemetery personnel to keep you from purchasing from another source. You may be told that if you purchase from an outside dealer there will be an additional fee. The truth is this may be illegal as they are penalizing you for purchasing elsewhere. They may say they are not responsible for cemetery headstones purchased from an outside dealer. This is the most popular statement we hear. While they may not be responsible for damage caused by damaged incurred during delivery, acts of nature or vandalism, they certainly are responsible if it is damaged due to worker negligence after they accept it. They may try to question the quality of the cemetery headstones sold by outside dealers. The fact is many monument dealers such as Everlife Memorials purchase cemetery headstones from the same sources that cemeteries do. You may be flat out told that they do not accept cemetery headstones from outside dealers. As long as the cemetery headstone meets their requirements they are supposed to accept it. If you feel you are being treated unfairly by the use of scare tactics simply tell the cemetery representative that you will report them to the Federal Trade Commission and the local Better Business Bureau. In most cases this will usually keep them from pursuing it.